Anita Fofie has navigated her career within the medical industry to a brilliant conclusion in finding her true passion. There was never a time in her life that she ever saw herself as anything other than a doctor. As a child, she remembers going through her father’s medical journals in utter fascination and awe. As a teen fresh out of high school, there was an automatic assumption that medical school was her obvious goal. She attended Yale University for her undergraduate studies and she earned her BA in biology & neuroscience. After that, she returned home to Canada to earn her Master’s degree at the University of Calgary in Alberta. While studying for her Master’s, Anita Fofie focused her research on topics related to Obstetrics and Gynecology. The research provided her with the unique distinction of writing two papers that were published. She was attributed as the first author in both highly accredited medical journals. She went to Northwestern University in Chicago to complete her rotation in OB-GYN. Upon completion of her rotation, she decided that OB-GYN was not her desired path for her future. After much soul-searching, she decided to follow in her father’s path and study as a general surgeon. Although this was not her dream, Anita moved to Seattle to train in General Surgery. She continued by taking a fellowship in anti-aging medicine and received her certification in laser surgery. After completing her education, Anita Fofie moved back to Canada. She opened a medical spa and skin care clinic in Vancouver. 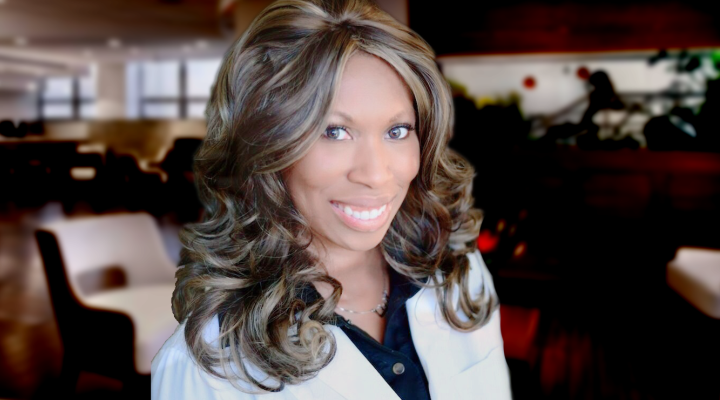 She had developed a passion for skin care and cosmetic dermatology. Her practice pivoted from minimally invasive surgical procedures to non-invasive esthetic skin procedures. She anticipates her future will continue in the field of dermatology. Fofie has recently accepted a corporate position in medical affairs with the dermatology immunology division of Johnson & Johnson. I have always known what I wanted to be. I was passionate about it. Like my dad, I always wanted to be a physician. Even in school I always loved the life sciences. The desire never changed. I knew I was going to be a physician since I was a little child. I am trained in general surgery. I have a fellowship in aesthetic medicine and anti-aging medicine. I specialize in Cosmetic Dermatology. I start our daily routine at 7 in the morning. I get my girls up and ready to start their day. After dropping my daughters off at their perspective locations, I go for my workout. Then it is back to my home office. I am currently working as a medical liaison for a small healthcare organization. The first thing I do when I get back to my office is answer emails, read or edit any articles, have conference calls, or contact other physicians. The last thing I do before leaving to pick up my girls is check in with the staff. It is back to being a mommy after work hours. We participate in many activities, such as soccer, swimming, and piano. Once we get home, it is homework, dinner, and bedtime. The thing that I love the most about being a physician is that I get to connect with people. I get to impact their lives. It is building that rapport and connecting with people. I also love being in the cutting edge of science and medicine and getting to use my education in that way. But my favorite part by far is connecting with people. What would you consider the greatest part of your career? The greatest accomplishment was when I wrote two research articles that were published. They were published while I was still in grad school. I was able to do that in my first two years. I was very proud to see my work published in concrete form in medical journals that had very large readerships. The second thing would be opening my own clinic. I saw that process through from scratch. I found the location, built up the clinic, built up my clientele and developed a curriculum for esthetic medicine that I was able to teach to other healthcare professionals. I enabled others who wanted to incorporate anti-aging medicine into their practices. The curriculum was for laser and ingestible that I started from scratch and brought to market. That is probably my most cherished professional achievement. Can you tell us about some of your volunteer activities? I have a very active life with my two daughters right now. So, I don’t volunteer as I used to. I volunteer at my daughter’s school. I used to volunteer with brain injury rehab center, that was one of my passions. I continued to volunteer beyond graduation. However, while I was in undergraduate school, I worked with medical missions. I’ve made a few medical missions trips to West Africa for education and outreach work. I’ve also gone to Ghana and Sierra Leone and in the Ivory Coast for HIV education prevention work. I also did a medical mission trip to Venezuela doing cleft lip repair work with a medical team, and that was when while I was still in medical school. What do you do mentally to separate yourself from the job? The one thing that absolutely works for me that helps me to unplug and de-stress is yoga. Do you have any advice that you would like to share?